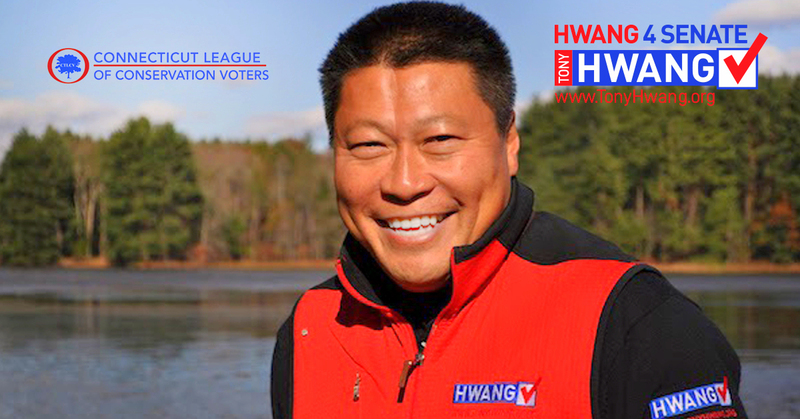 It’s with great pleasure I share the news that the Connecticut League of Conservation Voters has become the latest of the many organizations around the state that have have endorsed my campaign for re-election. Bob Stefanowski has launched Connecticut Women For Change, a group of women, led by his wife Amy Stefanowski, who support his run for governor. The Weston Republican Town Committee (RTC) is interviewing candidates for a vacancy on the Republican Town Committee, the town Library Board and the Board of Ethics. Republicans who would like to be considered for one of these positions should contact Katia Colaprico, chairman of the RTC’s Candidate Recruitment Committee, at WESTONrtc.ct@gmail.com. The 25-member RTC represents the town’s approximately 1,800 registered Republicans in political affairs, supports the election of Republican candidates, and screens and endorses Republican volunteers for the town’s principal boards and commissions. The RTC meets the second Tuesday of every month at 7:30 p.m. in Town Hall. The Library Board writes and implements policies, oversees long range planning, and works closely with the library director in preparing the annual budget. Each trustee is an advocate for the library and its staff. The nine-person board meets the first Tuesday of each month at 7:45 p.m. in the library. The Board of Ethics consists of five members, none of whom hold any elective or appointed Town office. The Board members receive, investigate, hear testimony, and render advisory opinions to town boards and commissions and when appropriate the Board of Ethics makes recommendations to the Board of Selectmen on alleged violations of the Town of Weston Code of Ethics. The Board only meets when the need arises. For more information on the Weston RTC, please visit www.westonrtc.org or attend a meeting. Sneak Peek of our Clam Bake auction items! Get a sneak peek of our upcoming auctions and bid ahead of time! We look forward to seeing you this Saturday. If you cannot attend, your bid will be placed at the time of the live auction. If you place the winning bid we will contact you for deliver of your auction item. 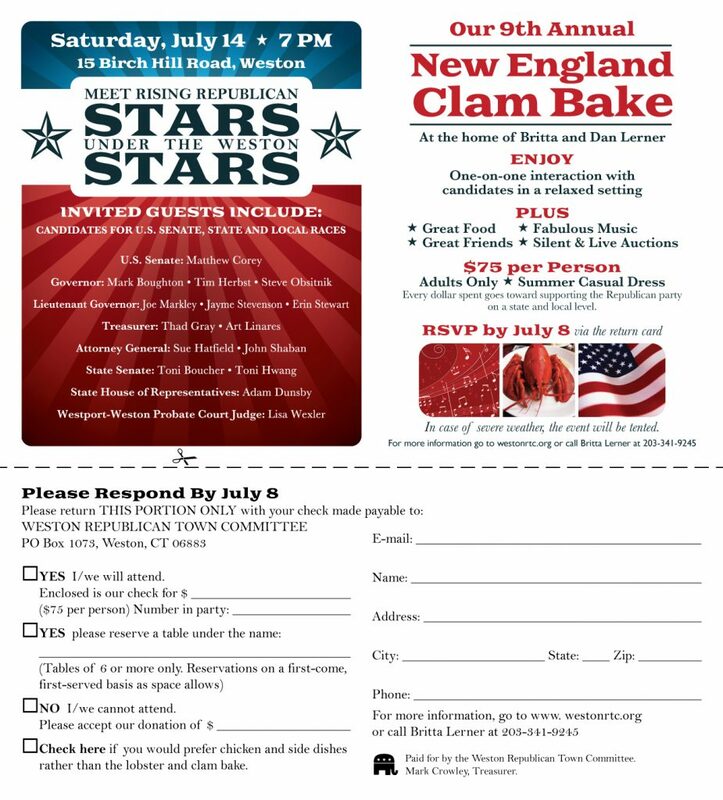 Join us JULY 14, 2018 at the Weston RTC Clam Bake ! 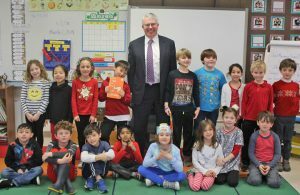 State Rep. Adam Dunsby (R-135) visited Hurlbutt Elementary School in Weston on Friday, March 2, to read to students in celebration of Read Across America Day, a nationwide reading celebration that takes place annually in honor of children’s author Dr. Seuss. Dunsby read Green Eggs and Ham by Dr. Seuss to a first grade class. 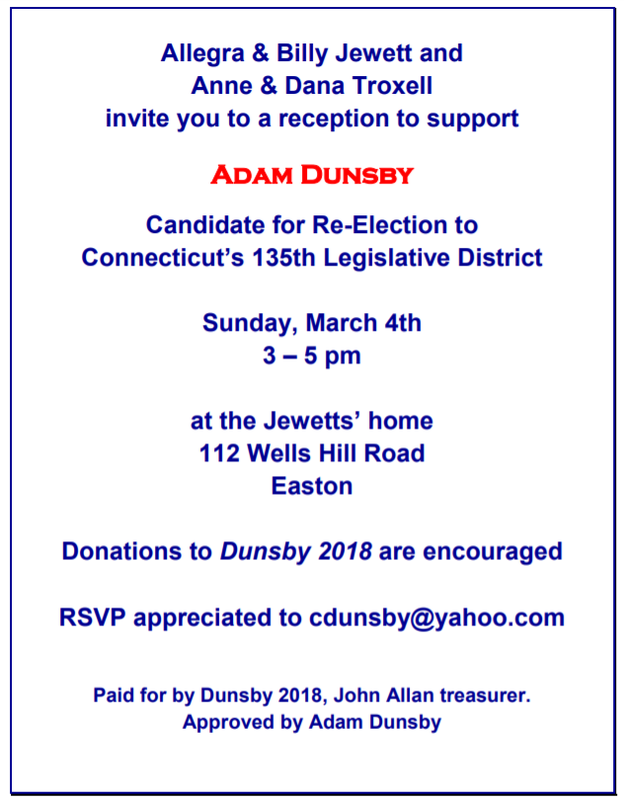 Donations to Dunsby 2018 are encouraged! Keisha Fink’s road to Weston was a typical one. 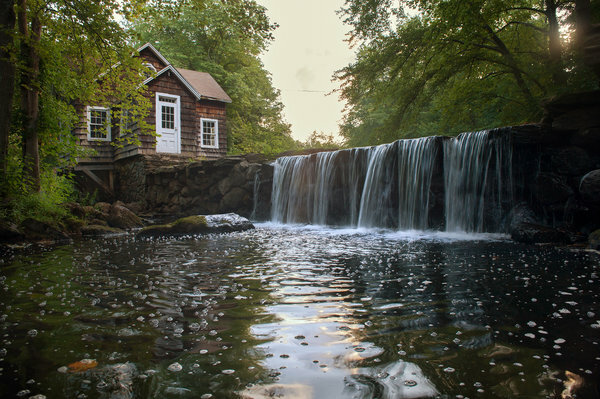 In 2015, she and her husband, William Fink Jr., were looking for a home in neighboring Westport, a popular town on the Metro-North Railroad line with beaches and a vibrant downtown. But prices were daunting and an agent suggested they might get more for their money in Weston, a town they hadn’t considered. We invite you and your spouse/friend to join us to get to know Rone Baldwin, RTC candidate for the Board of Finance. Rone has been living and working in St. Louis for four years, has returned home (a long-time Weston resident), and has much to bring to the Board of Finance. 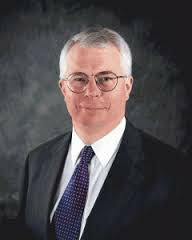 It’s important we all get to know Rone so we can put all our energy into getting him elected to the Board of Finance.